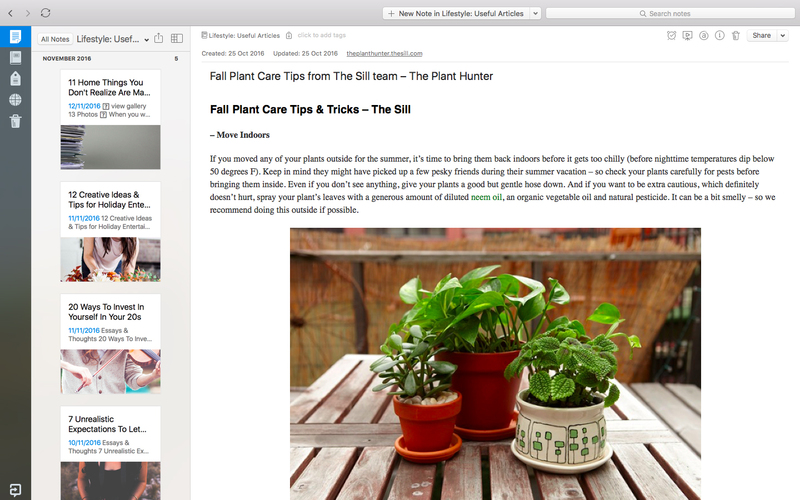 Evernote can be an amazing tool for organising your blog. With the tagline "capture what's on your mind," Evernote promises a smarter way to work. If you find your digital files are a mess and you need a workflow process that works, try this app. 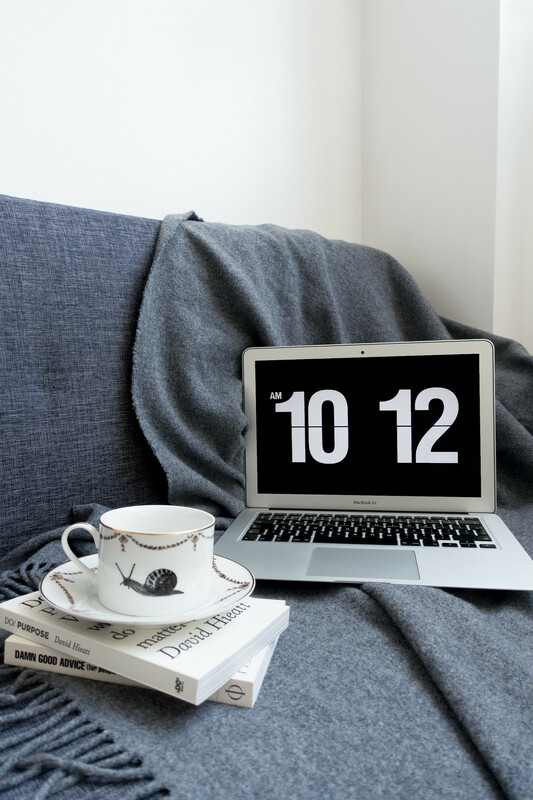 Here are a few simple ways Evernote can be used to organise your blog content and how I've made it work for me. Evernote Web Clipper is a browser extension that allows you to "clip" articles from the web and save them to Evernote folders. It's a simple way of saving and sharing content you find online. This is useful for bloggers to create something called a "swipe file." A swipe file is a collection of ideas and articles ready for quick reference when creating your own content. Compiling all the information you need into one easily accessible resource enables you to fully research ideas and create content faster. It also functions as a "read later" app for you to save articles you don't have the time to read immediately. I use the Evernote Web Clipper to save inspiring blog posts and informative articles as well as articles I want to revisit to read more thoroughly. I use topical notebooks to separate clipped content making it easier to find the information I'm looking for; you could also tag notes for quick access. 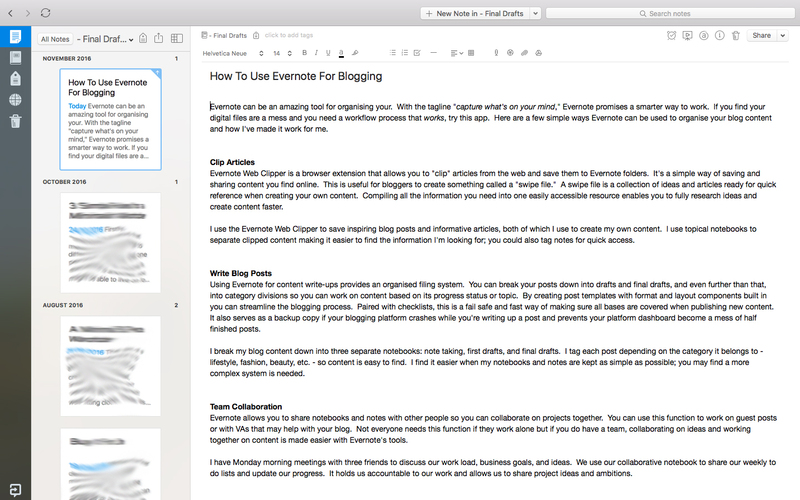 Evernote allows you to share notebooks and notes with other people so you can collaborate on projects together. You can use this function to work on guest posts or with VAs that may help with your blog. Not everyone needs this function if they work alone but if you do have a team, collaborating on ideas and working together on content is made easier with Evernote's tools. I have Monday morning meetings with three friends to discuss our work load, business goals, and ideas. We use our collaborative notebook to share our weekly to do lists and update our progress. It holds us accountable to our work and allows us to share project ideas and ambitions. Using Evernote for content write-ups provides an organised filing system. You can break your posts down into drafts and final drafts, and even further than that, into category divisions so you can work on content based on its progress status or topic. By creating post templates with format and layout components built in you can streamline the blogging process. Paired with checklists, this is a fail safe and fast way of making sure all bases are covered when publishing new content. It also serves as a backup copy if your blogging platform crashes while you're writing up a post and prevents your platform dashboard become a mess of half finished posts. I break my blog content down into three separate notebooks: note taking, first drafts, and final drafts. I tag each post depending on the category it belongs to so content is easy to find in Evernote. After the final draft I insert HTML and copy and paste the content over for scheduling. I find I work better when my notebooks and notes are kept as simple as possible; you may find you need a more complex system. There are a lot of aspects to keep track of when creating blog content. Use Evernote to create a checklist, which reminds you to proofread content, customise permalinks, insert keywords, photograph specific products, and share on social media, etc. You can also use notes to create blog templates, which you can use as the starting block for every post you create.